There are two very simple technique to create context menu in SharePoint 2010. This approach will use feature to create and deploy the context menu in document library. 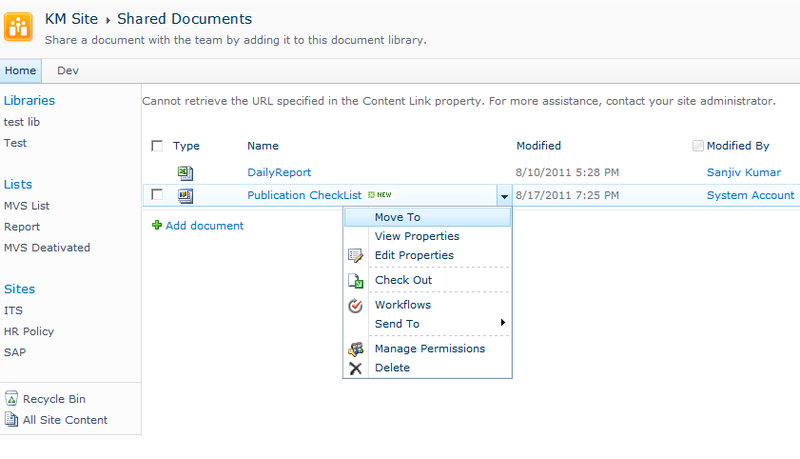 Drawback: Once feature will be activated, the context menu will be available in all document library. Create an feature file as below named Feature.xml. Create an menufest file as below named MenuItems.xml which contain the behavior of menu. Create a page in page library for redirection and replace the path in the MenuItems.xml file as you can see in the bold on. Final work, install and activate the feature. Create a folder in the 12 hives under Features folder named CustomMenu, and paste the both file (Feature.xml, MenuItems.xml) in the CustomMenu folder. And now execute the below command, that’s all. Custom context menu can also be created by SharePoint Designer 2010.
you can visit on the below site. Thanks for the clearcut explanation. I tried to add context menu to my documetn library using the same. But i could not able to see the newly added menu in context menu. i have created the welcome page, and also installed and activated the feature, i can see the feature status as activated in site features section. It looks, feature has not been installed and activated in the site, you should see the feature in site feature list.